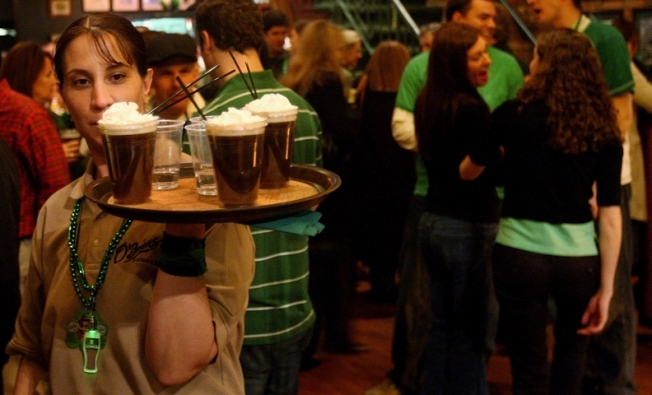 A San Francisco cafe is trying to make the world's largest Irish coffee. It's not every day the bartenders at San Francisco's Buena Vista Cafe pour 10 liters of Irish whiskey into a single cocktail. But Monday they did just that. In an effort to set a Guinness record for the world's largest Irish coffee, the cafe mixed nearly 10 liters of whiskey with 10 gallons of coffee, a gallon of heavy cream and more than 4 pounds of sugar, Buena Vista Cafe general manager Michael Carden said. The drink was served in a 12-gallon, 3-foot-tall, custom-made glass. "We took the same ration that we'd put in a 6-ounce glass and converted it to a 12-gallon glass," Carden said. The drink was initially going to be 15 gallons, but the cafe chose a 12-gallon glass to help keep the proportions and shape of the glass in line with the traditional Irish coffee they serve. "It looks like a giant replica," said cafe manager Larry Silva. The unveiling of the Irish coffee happened around 1 p.m. Monday and it took about 20 minutes for four bartenders to pour the ingredients in the glass. "Everybody went wild," Carden said of the crowd when the drink was revealed. Attendees of the cafe's 56th Irish coffee anniversary celebration were given drinks from the huge glass, which had a tap at the bottom. Bartenders added cream to the top of each individual glass served. The cafe is attempting to take all the necessary steps to ensure they set a world record. Carden said a public health official was there to certify the gigantic cocktail was drinkable. Additionally, witnesses signed an affidavit and video footage was taken of the drink. There is a six to eight week turnaround after the cafe files all materials before finding out whether the record has been set, Carden said. There is no current Guinness record for Irish coffee, according to Carden. The idea to go for the Guinness world record came from Buena Vista server Andrew Smith, who brought it up during a conversation on how to celebrate the anniversary of the creation of Irish coffee at the Buena Vista Cafe, Carden said. Monday's event was part of a three-day celebration that started Saturday, featuring Irish music and Celtic dancers to mark the anniversary.